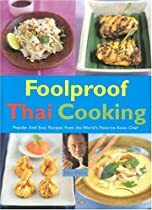 Ken Hom describes the basic techniques needed to recreate authentic Thai food and demonstrates 40 of the best-known dishes with step-by-step instructions. Photographs accompany every step from start to finish. Ken’s foolproof instructions will guarantee excellent results every time — whether you choose simple Pad Thai noodles, a Sour and Spicy Shrimp Soup or the more elaborate Red Duck Curry.